We are now finished grooming the ski trails at Black Mountain Forest for another season. I would like to make a few comments about our grooming experiences this winter, after switching from the snowmobile to the Chevy Blazer track truck, as our main grooming vehicle. Last year we learned that Valley Spur tested a blue Chevy S-10 Blazer track truck from www.AmericanTrackTruck.com, a U.P. company. After speaking with them, we found out that their trial was a success and that they decided to switch to a Blazer track truck as their main grooming machine, basically replacing their large Tucker Sno-Cat. Our main problem with a snowmobile was the frequent over-heating issues and resulting costly repairs over the past 3 years. Also, getting stuck time and again while pulling up the big hills in soft conditions was a certainty. Along with that came the unhooking, handling weights, yanking, shoveling and re-hooking, and then the unhealthy exhaust fume headaches associated with slow grooming speeds. Those fumes alone can be overwhelming after several hours, rendering the operator unable to ski himself the next day--which I took personal offense to! At this point last spring, once again, our liquid cooled snowmobile was back in the shop for major engine repairs caused by overheating. We contacted the guys at American Track Truck, Inc. and discussed our needs and how we preferred a Chevy Blazer as our “base” vehicle. There were many of these Chevy Blazer and GMC Jimmy vehicles produced over the past two decades, so finding a good used one to convert to a groomer is no problem. We kicked the idea around, counted our pennies, and with the aid of some generous donors, we ordered a track system for our Chevy Blazer. While the track system was being built, the Blazer underwent some preventive maintenance and modifications necessary for pulling a groomer roller/drag. This included the installation of a secondary transmission cooler and a transmission temp gauge, an auxiliary battery in the rear, rear work lights, strobe beacon, backup alarm, custom hitch and weights carrier, control switches and rear outlet for 12vdc linear actuators on the Ginzu, and a winch-operated drift-leveling blade attachable to the front as needed. These tasks can be performed by American Track Truck in their shop, or if you have the ability, you can do it yourself, like I did. When the tracks were complete, I drove to Chassell and picked them up. The American Track Truck guys explained the easy installation steps, and I made the journey back home. The very next day I had the tracks unloaded and installed to our Blazer. We had just gotten some significant snowfall, so the testing began immediately. I proceeded to some steep uphill grades, pulling the newly built and much heavier 8 foot roller. At this point the amazement really began to set in. The Blazer effortlessly pulled the roller up and down the hills, through deep unpacked snow. There was no bogging, no slippage, and no problem whatsoever. Throughout the season the Blazer track truck continued to amaze me. Grooming even the steepest hills without the need for running starts, the Blazer simply crawls up at whatever speed I choose. 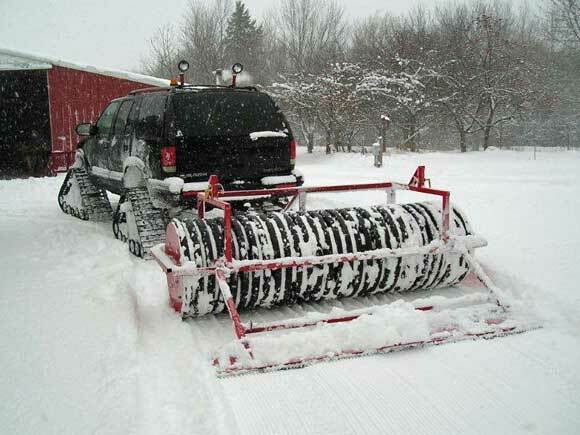 The headaches and backaches of using the snowmobile for grooming are now a distant memory. The track system worked flawlessly, with no adjustments or maintenance whatsoever needed during the grooming season. And our post-season inspection tells us the entire truck held up just great, so we have no surprise repair bills like we incurred with the snowmobile. If anyone else is considering upgrading their grooming operation, I highly recommend giving this option some thought. Compared with the alternatives, a track truck is economical and efficient, and is capable of towing heavier and wider groomer roller/drags. This not only reduces the number of passes, but also produces an overall better trail for the skiers. And best of all, the operator isn’t all beat up after grooming and can ski too! With this in mind, I even sent my skis in for stone grinding, since I can now look forward to skiing next year, and not just grooming the trails!